'AHS: Apocalypse' - Did We Meet Evan Peters', Billy Eichner's Characters? 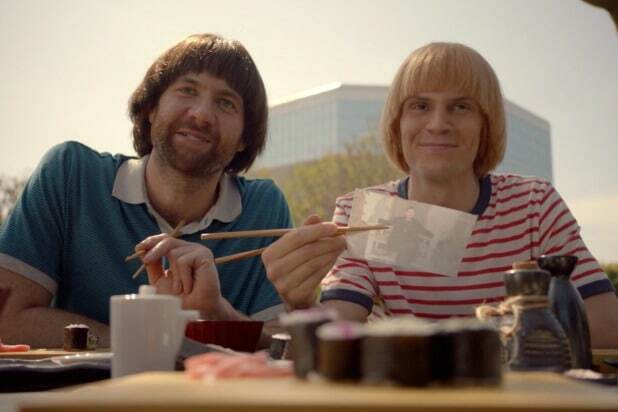 On the latest episode of “American Horror Story: Apocalypse,” the show introduced us to a pair of robotics engineers who had sold their souls to Satan in exchange for career success — played by Billy Eichner and Evan Peters sporting hilarious bowl cuts. And we have a feeling we may have already met these characters back at the beginning of the season. It’s tempting to think these are just a pair of new characters for Peters and Eichner — the second “Apocalypse” character for Eichner and fourth for Peters. 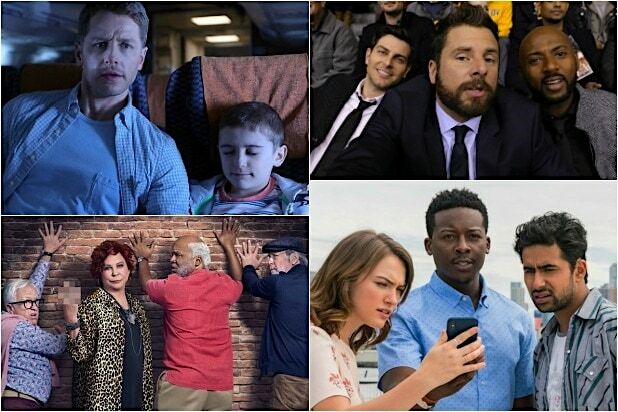 Eichner showed up in the early part of the season as Coco’s (Leslie Grossman’s) boyfriend Brock, who gets left behind when the nuclear devastation happens, and Peters has played Coco’s hairdresser Mr. Gallant, as well as reprising his “Hotel” and “Murder House” characters. Obviously, it’s not unusual for actors to play different characters in “AHS,” because it’s an anthology series and a lot of the same people come back for each season. And since “Apocalypse” is a crossover between two previous seasons, there’s been a lot of folks playing multiple roles within this season as they bring back old characters and introduce new ones. But something interesting within “Apocalypse” is that we now have three actors, Peters, Eichner and Joan Collins — who is both Evie Gallant and Bubbles McGee — who have played multiple characters that are original to this season. It’s not the first time something like that has happened in “AHS” history, but the way these characters have popped up is pretty unusual. And it leads us to believe that each of those actors is actually only playing one new character, not two, that Peters’ Jeff the robotics engineer and Mr. Gallant are the same person. That Colins’ Evie and Bubbles are the same person. And that Eichner’s Mutt and Brock are the same person. Contrast this situation with the myriad of folks Peters played in “Cult” last year: He played Kai, the main protagonist, as well as a bunch of historical figures that Kai hallucinated. So not people who exist in the present, real narrative. These new folks in “Apocalypse,” meanwhile, are active participants in the overall story of the season. If you think back to the third episode, which feels like a lifetime ago, you’ll recall that when the witches from “Coven” came to Outpost 3 after the robot Ms. Mead poisoned everyone, they resurrected three characters and revealed that they were actually witches who had been placed under an identity spell, which at minimum made them forget they were witches. Two of those characters were Coco and Mallory (Billie Lourd), who had been acting, under the spell, as Coco’s assistant prior to the apocalypse. Given that Coco and Mallory were living at least semi-fake lives prior to the apocalypse, it follows that the people closest to them could also have been placed under an identity spell. Considering the spell was apparently part of Cordelia’s (Sarah Paulson’s) plan to fight Michael Langdon (Cody Fern), it would useful to place people around Coco and Mallory who wouldn’t blow their cover. And so it would be a very “AHS” twist to have a fourth witch, Bubbles, as backup. And to have another character, like Mr. Gallant to make sure Bubbles ends up where she needs to be. Plus, using an identity spell on other characters could give Coco and Mallory pre-existing relationships in the wild to bolster their cover. It’s not a perfect theory, however, as there are a few issues that I can’t explain. One very big one is that Venable and Mead, who were running Outpost 3, knew Jeff already because Venable worked at his robotics lab and he actually made Ms. Mead. It would be pretty convenient for them not to recognize him even with his dramatic makeover. Likewise, Coco and Mallory were using their real names under the identity spell, and Coco has maintained her relationship with her real family up until the moment they’re incinerated in a nuclear blast. And Coco, at least, seems pretty much like the same person before and after the spell. Brock and Mr. Gallant, by contrast, are completely different than Mutt and Jeff — but for the spell to really work that change would be necessary considering Jeff and Mutt are devoted servants of Satan. The differences between Evie and Bubbles fall somewhere in between — both characters are actors, but Evie is losing her faculties to age while Bubbles is still super sharp. So this theory is a bit out there, and has lots of holes — but, honestly, that’s not any different than just watching the show itself given how it’s structured for maximum surprise. Even with only two episodes left, there’s a ton we don’t know about what’s going on in “AHS: Apocalypse,” so it’s hard to imagine any major theory about what’s coming could be airtight at this point. Either way, we’ll find out very soon.